Since I'm giving away a currently sold-out, Limited Edition Peter Som Color Box by Zoya, I figured it would be a good idea to see just how GORGEOUS these colors are! So while the winning shade for Day 21 of the 30 Days of ZOYA Challenge/giveaway will now be featured as Day 22 tomorrow instead, here is the LE collection! First up is Evvie, what Zoya describes as a Eucalyptus creme. She definitely has a greyish-greenish-bluish tint to her that is very difficult to describe. It's a murky water type of look that wound up being more flattering on me than I expected. This is with three coats. Next is Audrey (likely named for Ms. Hepburn, but more on that in a minute) and she is the only sheer pink of this type that I own. I don't even own my namesake, Danielle. But Audrey is making me lean more in that direction now. This is with three coats. The best way I can describe her for me is like I described OPI In the Spotlight Pink and that is the "my nails but better" look. I think she would make an excellent base for a french, light and delicate like Audrey Hepburn. Now as opposed to Audrey Hepburn, Katharine Hepburn (note the spelling… much more than coincidence here) was anything but demure. She was a strong powerhouse who could run with the boys and golf with the best of them. While filming the African Queen, she refused to listen to Humphrey Bogart and defiantly drank gallons of local water a day, only to wind up with dysentery as a result. That was Katharine in a nutshell. So this dark, cranberry jelly personifies her perfectly. This last shot is Katharine in normal interior lights, in which it is really opaque. The flash makes it seem more sheer than it actually is. While this shade took a lot of coats, I felt it has a very unique look, much like the sorbets from the OPI Texas collection. Overall, I really dug this collection. I knew I was going to love Katharine, but was surprised that I fell in love with Audrey. If I had to pick, I'd rank Evvie third. However, it's not that I don't like the shade… I just love the others so much more. I love Audrey, especially with your skin tone! I really like Audrey! I need to get a pale pink also. :) I think all the colors in this collection are great though! I think Evvie is my favorite! So unique! Oh my gosh, I LOVE Evvie!! I have to say I'm liking Katharine with only one coat. I don't know if its your nails, but I'm totally digging the sort of tie-dye effect. So chic and classic! Gorgeous! And very generous of you to host this giveaway. Thank you. I am really liking Audrey!! I'm torn between Evvie and Katharine. I was in love with Evvie already, but Katharine looks amazing on you! Evvie! 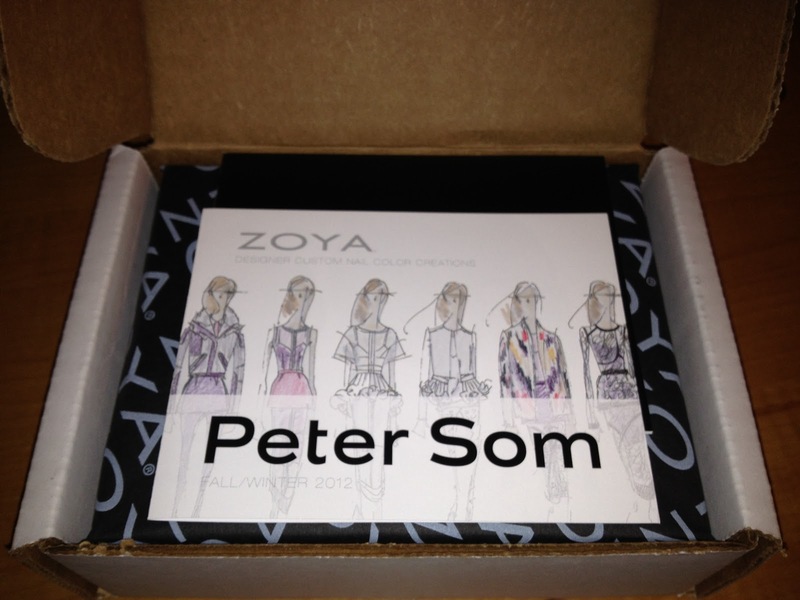 I ordered the box specifically for her, and I'm selling the other two to ladies in the Zoya Exchange group, haha. I thought Evvie would be my favorite by the description & bottle, but Audrey might be my favorite in the Peter Som collection. Now that I've seen this I think I need her. I was most excited about Katharine, but now that I see your photos, I love Audrey! Thanks for showing the difference in coverage in coats for Katharine. OMG. Evvie is soooooo lush. Audrey is pretty amazing too. So pretty! I'm loving Evvie. But really, they are all fantastic and I'm super bummed I missed out on them. I'm surprised to say that I like Audrey most! I don't typically lean toward such light colors but she's very pretty! I love the color of Katharine, but not sure I like how sheer it is. I'd love to try layering her over other things, but I don't have time or patience for 5 coats.